The procedures for adjudicating claims of sexual misconduct by college and university students have been and continue to be the subject of great controversy. The ways in which claims of sexual misconduct are addressed by colleges and universities vary greatly among institutions and often vary from the way in which analogous claims would be addressed in either criminal or civil courts. In recent years there have been disagreements among advocates with respect to standards of proof, the role of counsel for the accused in the process, and how evidence should be presented. In 2011, the Office of Civil Rights of the United States Department of Education issued a “Dear Colleague Letter” that advised colleges and universities that they faced potential liability under Title IX of the Civil Rights Amendment Act of 1972 (“Title IX”) unless they changed their disciplinary processes to be more favorable to claimants. In September 2017 the Department of Education rescinded the 2011 Dear Colleague Letter. The New York Times recently reported that the Department of Education will be issuing new rules in the near future. On September 7, 2018, the United States Court of Appeals for the Sixth Circuit joined the fray over campus disciplinary procedures. In Doe v. Baum, No. 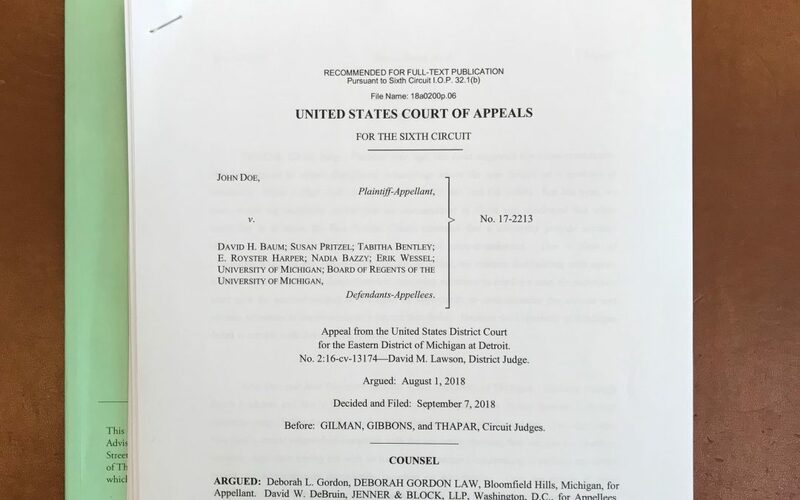 17-2213, the Court held that a University of Michigan student who had been found responsible for a sexual assault in a campus disciplinary proceeding made a plausible claim that he had been denied due process, as guaranteed by the Fourteenth Amendment, because he did not have the opportunity to cross-examine his accuser. This is a very significant decision. In 2015, the American Law Institute launched a “Principles Project” addressing campus disciplinary procedures in cases where sexual misconduct has been alleged. Unlike the ALI’s Restatements, which “reflect the law as it currently stands or might appropriately be stated by a court.” Principles Projects are the ALI’s suggestions for best practices. I have participated in the Members Consultative Group for the Project on Sexual and Gender-Based Misconduct on Campus since its inception. Our next meeting is in New York on November 15-16 and I look forward to another interesting discussion in this evolving area of the law. If you have questions about campus discipline, Astrachan Gunst Thomas, P.C. can help. Contact Mark Stichel at (410-783-3547) or Elizabeth Harlan at (410-783-3528).